Paul Nuttall resigned with immediate effect Friday as leader of the anti-EU UK Independence Party following a general election in which the party lost support and failed to win a single MP. UKIP lost support and failed to win a single MP after the British general election. Boston, United Kingdom: Paul Nuttall resigned as leader of the anti-EU UK Independence Party on Friday after its support evaporated in the British election and it failed to win a single seat. UKIP spearheaded the push for Brexit and Nuttall insisted that the party would still remain influential as Britain heads into divorce talks with the European Union. "A new era must begin with a new leader," Nuttall told a press conference as he resigned with immediate effect. Under the leadership of the charismatic Brexit figurehead Nigel Farage, UKIP won 12.6 percent of the vote in the 2015 general election, though only one MP under Britain's first-past-the-post system. UKIP's rise nudged then Conservative prime minister David Cameron into calling a referendum on Britain's EU membership. The party was at the forefront of the Brexit campaign as 52 percent opted to leave the bloc in the shock June 2016 vote. But after Farage quit, feeling his life's mission accomplished, the party fell into disarray. Nuttall, a 40-year-old former university lecturer, took over in November 2016. Farage suggested Friday he would return to frontline politics if the Brexit process was in trouble. "I would have absolutely no choice but to do exactly that," he told BBC television. Asked about a future role for Farage, Nuttall said: "If Nigel Farage wants to come back, I would be more than happy to do a job swap." Farage leads the eurosceptic bloc in the European Parliament and hosts a radio chat show. Polls had predicted that UKIP voters would flock to the Conservatives to back Prime Minister Theresa May's so-called "hard Brexit" stance, which would pull Britain out of the EU's single market and the customs union. But early analysis of the results Friday showed that UKIP voters had split between the Conservatives and Labour. With May losing her Conservative majority in the snap election, Nuttall warned her position had weakened and insisted UKIP was now "more relevant than ever" and would still be the "guard dogs of Brexit". "We now have chaos. Theresa May has got this so wrong. We could end up in a situation where there is a backsliding on Brexit," he said. "UKIP is still here and UKIP is not going away," he said. "UKIP could be bigger in the future than it ever was before." UKIP stood in far fewer constituencies than in 2015 and their national vote share plunged to 1.8 percent, dropping from third place to fifth in the popular vote. Nuttall stood in Boston and Skegness on the English east coast, which had the highest pro-Brexit vote in the country. Some 76 percent in the town of Boston voted to leave the EU in the referendum. 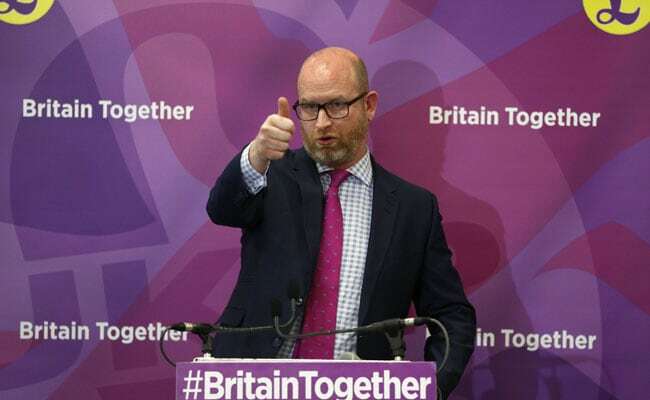 But Nuttall came third in the constituency with 7.7 percent, UKIP's score down 26 percent on the 2015 general election as the Conservative candidate won with 64 percent of the vote.